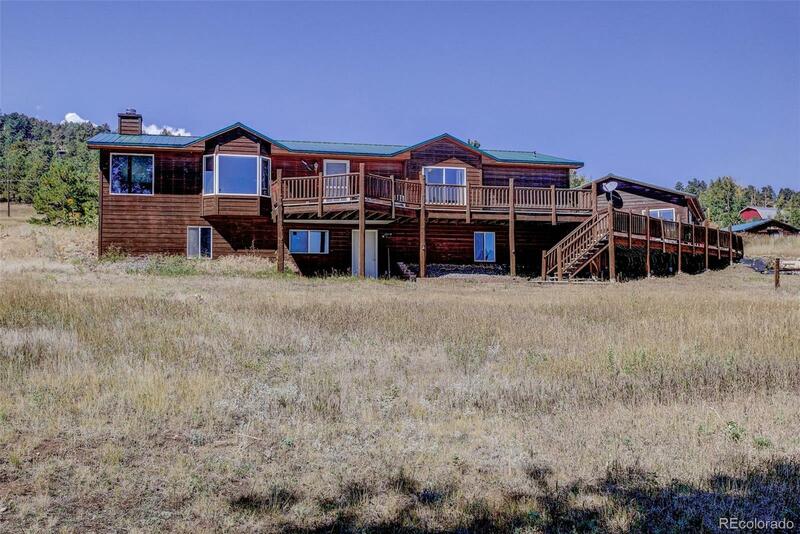 The mountain views from every corner of this home are stunning as is the entire 4 acre parcel. The many updates make the inside just as lovely. From the mountain modern style accents of barnwood trim to the new slate kitchen floors and rustic finish eco bamboo floors throughout, you will find special details that delight. The gourmet kitchen offers a new island, new paint, new dishwasher, new trim and more. Huge living area with bright open windows and incredible views! Wood-burning stove area has new Colorado tile base. Lovely dining room with new lighting! 3 beds up, 2 bath, and main level laundry. Basement is ready for flooring, all walls, electrical are done. Lower level has rec room, bed and study. Huge trex deck to enjoy the sunrise! Radiant heat floors both levels! Extremely low heat bills. Detached 23 x 35 sf, 2 car garage with heated work room/studio attached. 12 x 16 shed for additional storage. ADA ramp access to home. 30 minutes to downtown Golden, Boulder or Arvada.